On the midst of the 40th anniversary of the 1979 revolution against the Shah’s dictatorship, farmers, teachers and others took is to the streets to demand their rights. The peaceful protest was attacked by regime forces. 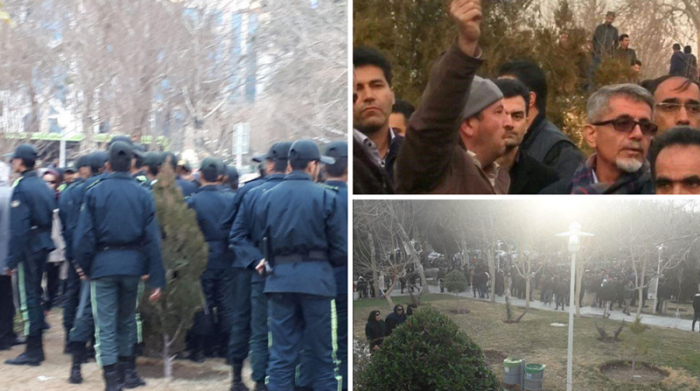 The MEK sources inside Iran reported on Thursday, February 7th, that the security forces in Iran attacked hundreds of protesters, many of whom were teachers, during a demonstration for water rights in Isfahan. The protesters assembled near the Zayanderud River earlier that day to demand that the regime allow the river to flow through the Isfahan region so that farmers there can water their crops. Over the past nine years, the regime has built factories upstream of the river and diverted water to other regions. This has dried the river before it could reach Isfahan. The once prosperous farmers in the region have been left without water to irrigate their crops. Agriculture is the primary industry in Isfahan, so virtually everyone in the province has been affected by the loss of water. 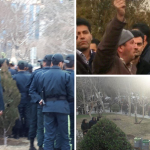 Farmers in Isfahan have been protesting for water rights off and on for the past year, but their concerns were dismissed until recently. The regime recently bowed to public pressure and opened the river, after more than a year of protests by Isfahan’s farmers, allowing the waters of the Zayanderud to flow once more into the region. Videos on social media show water flowing under the Khaju Bridge for the first time in nine years. Locals celebrated the return of water to Isfahan. One man was so overcome with joy that he kissed the ground. The regime has only agreed to open the Zayanderud temporarily, though, so protesters gathered on Thursday to demand that the Iranian regime make the change permanent. Reports from the MEK network indicate that many of the protesters were teachers from Isfahan who spread the word to others, asking them to join the protest. People from various sectors of society heeded the call and also participated in the protest. Pictures of the protest shared on social media show teachers holding up photographs of fellow teachers who have been imprisoned for participating in labor unions or taking part in teachers’ strikes and protests over the past few months. Teachers across Iran have staged a number of strikes and protests to demand better pay and working conditions, the right to form labor unions, and the release of their imprisoned colleagues. The regime has responded by arresting and imprisoning teachers for protesting and ignoring their demands. Regime security forces arrived on the scene of the rally and attacked the peaceful protesters with tear gas and pepper spray in an attempt to end the demonstration and disperse the protesters. The Iranian people have been protesting for over a year though, and no longer fear the regime or its security forces, so the protesters were not deterred. The people chanted, “Don’t be afraid, we’re all together!” and “We are teachers, not criminals!” to the security forces as they attacked. The regime has been quick to suppress any rally or other forms of dissent, fearing that protests could spread and lead to calls for regime change. Since the massive nationwide uprising began in December 2017, anti-regime protests have threatened to topple the mullahs and replace them with a democratic alternative. The MEK has grown in popularity, which terrifies the regime, who sees the MEK as an existential threat. The theocratic regime has responded to the widespread unrest with a brutal crackdown of all dissent, arresting thousands, imposing harsh criminal sentences, executing citizens in large numbers, torturing detainees, targeting protesters and political activists for harassment, and engaging in terrorist activities on European soil against the MEK. Despite these brutal acts of suppression, the people of Iran have not ceased their calls for regime change and continue to protest for freedom from the mullahs’ rule.